A school trip to a police firing range that saw pupils with toy guns aim at targets helped put their minds at ease over terrorism, the school says. The Year 3 pupils were invited to West Midlands Police’s firearms training facility after writing to officers following recent terror attacks. A police picture of the pupils aiming plastic replica firearms at targets drew criticism on social media. But Kings Norton Primary School parents had only “praise”, a spokesman said. 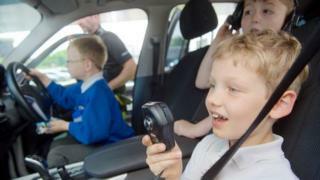 West Midlands Police said the visit was to give pupils an insight into their work. Sarah Massey said she was “horrified” by a picture of the event. But an anonymous parent of a child who went on the trip said: “We just want to express our support for the trip, our son got a huge amount from it and it went a long way to explaining why armed police exist and why there have been more visible recently. The school said any issues that concern pupils are freely discussed and, after some had noticed an increase in armed police in the city in light of the recent terror attacks in London and Manchester, they “were naturally concerned”. 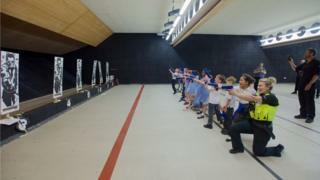 Children then wrote to the force to thank them for their work and were subsequently invited to the firearms training facility in Aston, where they spent a day looking at “all aspects of police work, looking at the firing range was a small part of the visit”, the school said. “The children enjoyed themselves. They learned a great deal and their minds were put at ease around their initial concerns,” the spokesman added. No parents have contacted the school about the visit apart from to “praise us for the work we do”. As part of the visit to the facility, the pupils also got to dress up in riot gear and talk to officers about their jobs.